Floor or roof truss, girder/beam and column specs with Delaware seals not required to be submitted at time of plan review. Plans must be drawn to a legible scale. 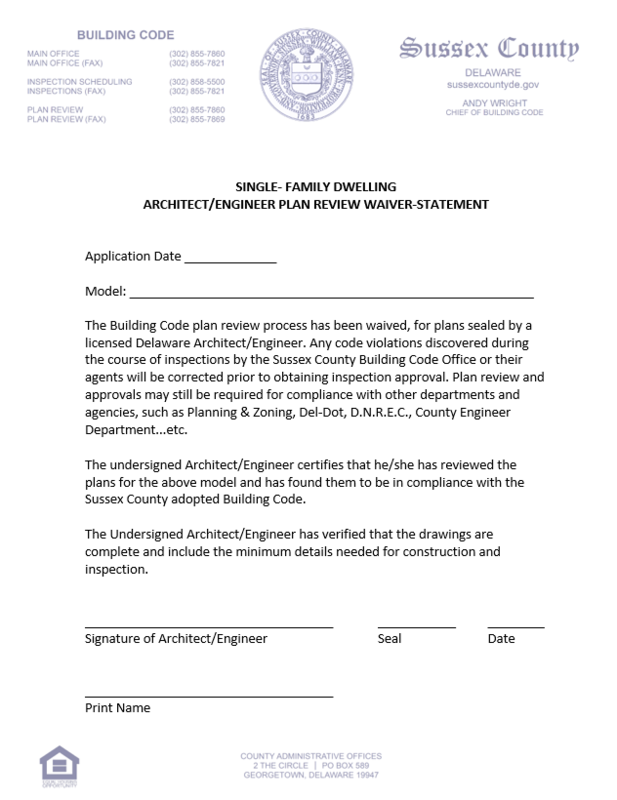 Piling plans shall submit plans bearing a licensed Delaware engineer seal. * Energy compliance worksheet (Res-Check) designed to the 2012 IEEC must be provided for all new homes at time of plan submittal. * Manual J & S forms must be provided for all new homes at time of plan submittal. * For more information see ADDITIONAL INFORMATION F.A.Q. under F.A.Q. tab. Shape and overall size and dimensions. Pier or column footing sizes and locations and spacing. Include any pilasters. Size and location of girder(s) (if applicable). Floor joist size and direction. Room sizes and label all uses (if applicable). Sizes and location of windows, doors and fireplaces. Attic access size and location (if applicable). All header sizes, type and locations. Size, depth & location of all post holes; dimensions between holes OR continuous footer size with number of masonry courses. Sizes and spacing of all girders / beams, floor / ceiling joists, walls, roof rafters (or trusses) and posts. Roof pitches and all coverings. Structures with upstairs to have a full view cross section. Include location of all steps, windows and doors. Exterior wall covering (if applicable). Roof pitches and covering (if applicable). Include location of all steps, windows and doors (if applicable). Size, depth & location of all post holes; dimensions between holes. Location and size of all overhead garage doors, entry doors, and windows. Include all header sizes. Height of posts from floor to bottom chord of roof trusses. Size of all headers / carriers and anchoring to posts. Exterior side wall coverings including size and spacing of all girts. Size and spacing of engineered roof trusses to be installed. (Delaware sealed roof truss specifications to be on job site at time of framing inspection.) Include purlin size & spacing. Structures with upstairs to have a full view cross section with floor joist sizing. Cross section of stairs to second floor to be included. Pole buildings with approved habitable living space shall be built to single family home requirements. See * Dwellings (Single Family). The Sussex County Building Code Office offers Builders/Developers the opportunity to place multiple model home types and options repeatedly built on our Fast-Track Program. Below are the steps and requirements that must be provided to our office to allow different home models to be waived from our "Standard" plan review process. Also, please refer to the different forms below. 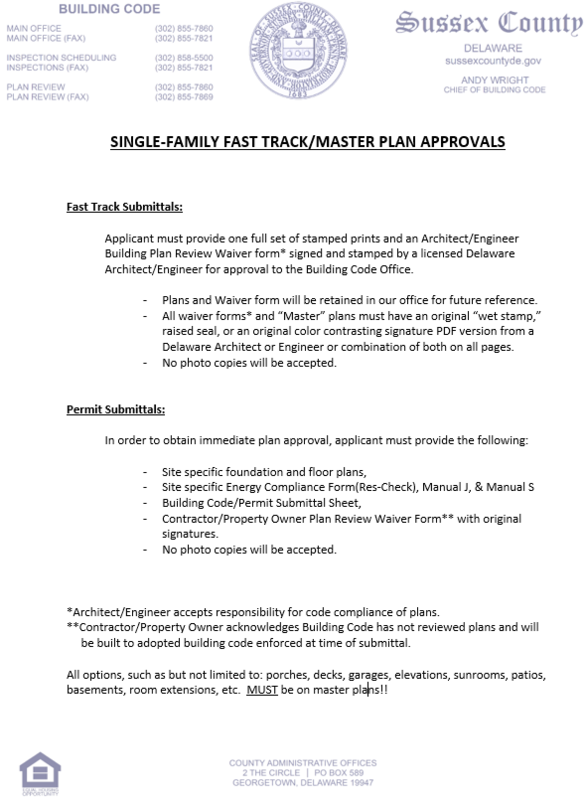 This form must be submitted with the initial master set of plans for each type of model home to our office in order to be placed on the Fast Track list. Signatures and stamps must be original and in color. This form acknowledges the designer accepts all responsibility for any code violation found during our inspection process. 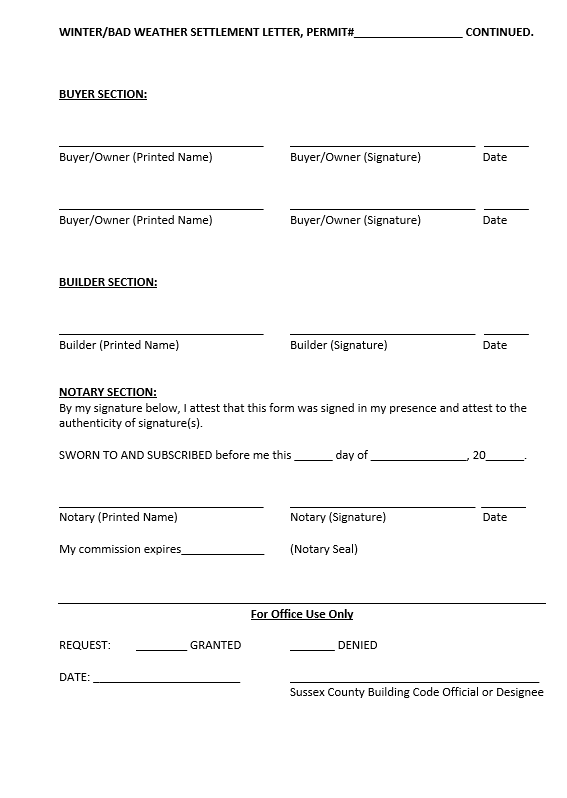 This form is to be provided to the Permit Office at time of submittal for a specific home after the home model has been placed on the Fast Track list, in order to obtain a county permit. 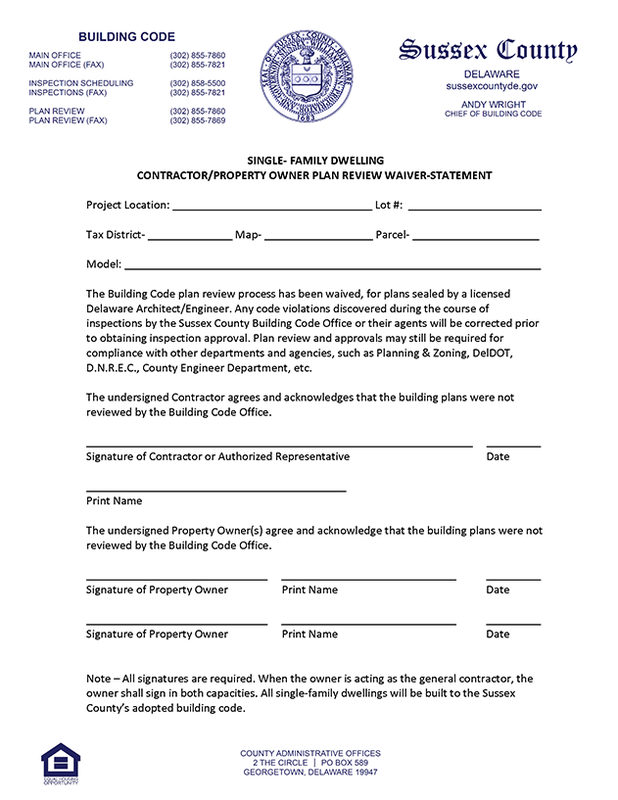 This form acknowledges both the contractor and the property owner are aware the Building Code Office has waived the "Standard" plan review process. 1. 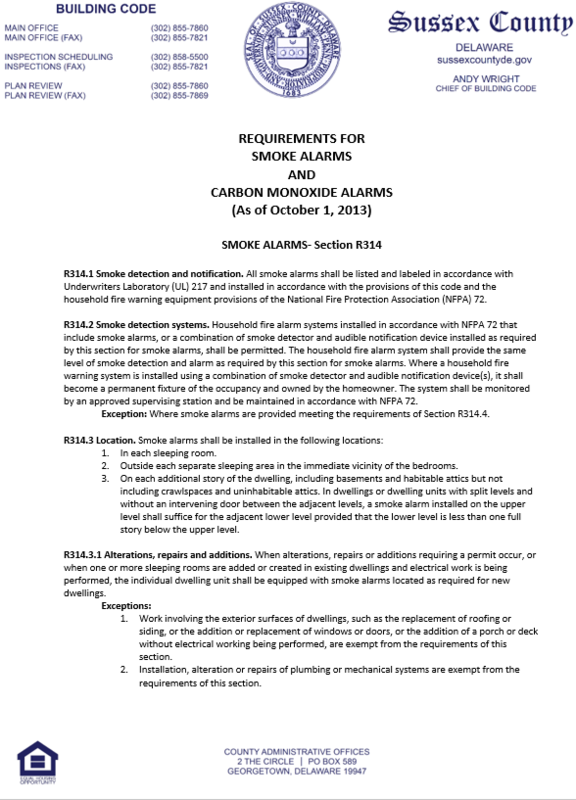 When & where do I need a smoke detector/carbon monoxide alarm? 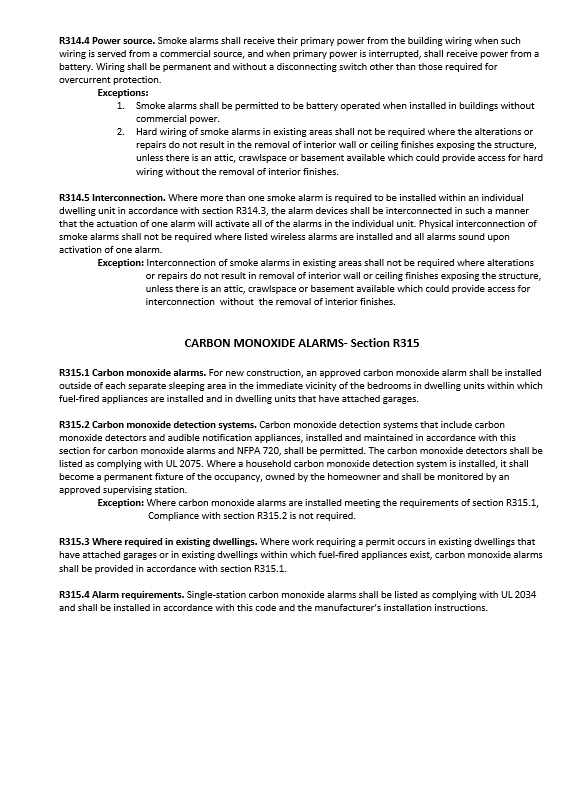 Please refer to the "FORMS" tab for the requirements in the International Residential Code (IRC) Smoke Alarms R317.1 & Carbon Monoxide Alarms R315.4 effective 10/1/2013. 2. Do I need a floor or landing at an exterior door? A landing is not required on the exterior side of a sliding door. 3. Do I need a landing at my interior stairway? Yes, at both top and bottom of stairs. A floor or landing is not mandatory at the top of an interior staircase, including stairs in an enclosed garage as long, as the door does not swing outward over the stair. 4. What is the minimum footer size in Sussex County? Continuous footer: 8"x 16" – no rebar required but recommended. 5. What is the minimum depth of footers? The minimum depth is 24" to the bottom of the footer from final grade. 6. What is the minimum size for a post hole? The minimum size is a 10" hole for a 4"x 4" post. 7. Are Gutters and Down Spouts required on a new home, addition or detached building? Yes, new homes, additions, and detached buildings are required to have gutters and down- spouts to collect and convey roof water away from the buildings foundation. Exception: homes on structural pilings or pole style buildings do not need gutters. 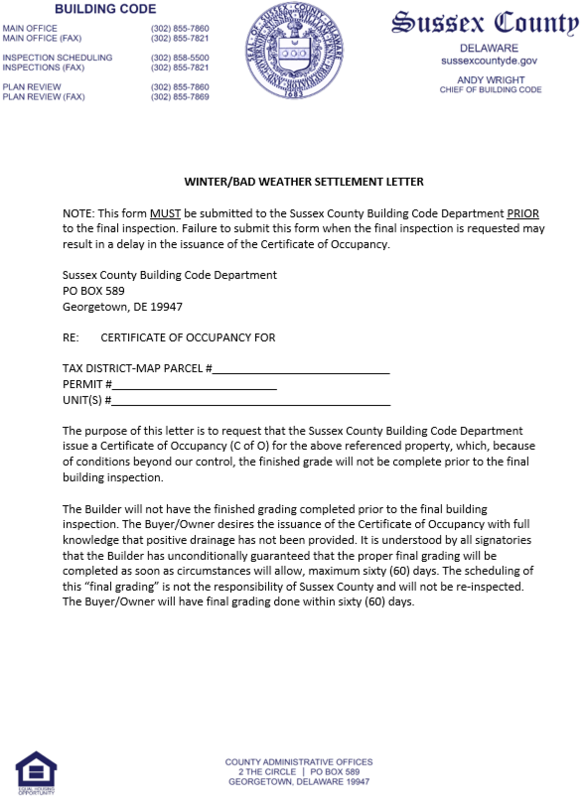 Also, a certification from a Delaware Engineer based on soil analysis may waive gutter requirements. 8. Is there a list of code requirements? Yes, please refer to our “Additional Code Requirements” sheet under the Forms tab. How is my tax bill assessed? I’m over 65/disabled, may I be Exempt? How can I make my M.H. a class “C”? How much is my Building Permit? What documents do I need to submit for a building permit? Can I get my c/o? What’s my property zoned as? I have code question about my Commercial Project / Single Family Project? What is required for Single Family Plan Review? What is required for Commercial Plan Review? Can I set up an inspection? Where can I get a copy of my plot plan? How can I get my 911 address? Manual J is the protocol used for determining the amount of heating and cooling that a home requires to keep its occupants warm in the heating months and cool and dry in the cooling months. Manual S is used to size and select the heating and cooling equipment. The goal for equipment selection is to install heating and cooling systems with the same heating and cooling capacities as the heating and cooling loads of your home. Below are the accepted approved software programs. For more information, visit ACCA. A REScheck report is an energy code compliance analysis which documents that your residential building will meet or exceed the energy conservation standards developed by the U.S. Department of Energy Office of Building. The REScheck report includes Certificates of Compliance and Compliance Checklists consistent with the International Energy Conservation Code (IECC). Square footage is based on the total area to be constructed and/or to be renovated, including storage areas, deck, porches, balconies and basements. The above fee schedule provides plan review and up to five on-site inspections. Any additional inspections after the fifth shall be charged $40.00 per trip. Modular homes will be charged a flat rate fee of $150.00. Any site-built additions (garages, porches, decks, finished upstairs in cape cods, etc.) will be charged a total flat rate fee of $190.00. Any unattached buildings less than 400 total square feet or deck additions that are 30 inches or less above finished grade do not require a plan review or inspections by Building Code. A single-family dwelling is defined by Sussex County Building Code as being a home for one family or household to occupy for residential living with only one kitchen and can inculde additions such as bump outs, sunrooms, garages, decks and porches.